The way it holds your wrists to make you feel secure, how it wakes you up in time to let your rise along with the sun, how it reminds you that it’s a quarter after three and the waves are good and you need to be out there, the manner its style fits with yours without fault no matter where you take it—some things are designed this way; intended to come alive as you come alive. Nixon, the watch, audio and accessories brand from Southern California, follows such design. And just recently, it held a launch event and media preview of its Season 2-2012 last July 5, 2012 at 7th High, Bonifacio High Street as it officially set foot on Philippine shores. The event fronted how this new collection is yet another expression of who the Nixon brand is crafted for: unique individuals with unique tastes—as evinced by the notable personalities from multifaceted outfits that graced the night. SinoSikat – both from the music industry. Team-designed, and custom-built, Nixon’s latest line introduced fresh flavors like Leopard Print Acetate, the ultra-utilitarian All Black Nylon, the shockingly vibrant Orange Bang, along with a dose of dreamy Rose Gold/Chocolate watches to name a few—revealing the brand’s sports heritage, as well as its contemporary fashion. 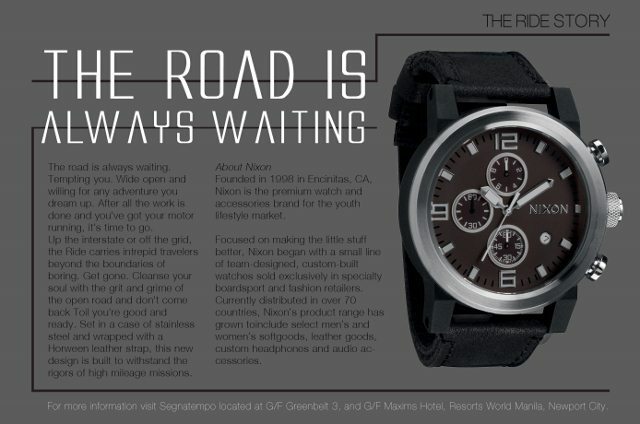 Founded in 1998 in Encinitas, CA, Nixon is the premium watch and accessories brand for the youth lifestyle market. Focused on making the little stuff better, Nixon began with a small line of team-designed, custom-built watches sold exclusively in specialty boardsport and fashion retailers. Currently distributed in over 70 countries, Nixon’s product range has grown to include select men’s and women’s softgoods, leather goods, custom headphones and audio accessories. As Nixon continues its legacy of combining the highest quality craftsmanship with globally- inspired design through this collection, Season 2-2012’s unique new materials add depth and character to the collection while pop colors and progressive styling keep things light and bright. From materials to function to finish, Nixon once again proved that it takes no shortcuts in crafting its products as it considers every detail element essential to uphold its commitment of making the little things better. Nixon is available in Billabong, Aloha Boardsports, Five-0 Skate Shop, Segnatempo, and Watch Republic branches. For more information, visit . A race has always been considered as a grueling form of workout, combine that with cycling and swimming and exhaustion is just a mere distance away. 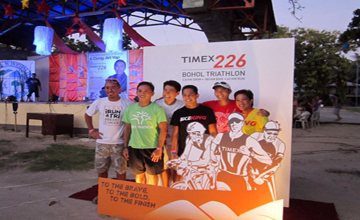 This however, would just be a piece of cake for the participants of the 2nd TIMEX 226 Bohol Triathlon. The said event which began last year will be initiating its second leg this coming December 1, 2012 at the Anda Beach, Bohol. The province well known to be the home of the wide-eyed tarsiers and chocolate hills will test the vigor and strength of the athletic buffs who were brave enough to answer the challenge of this fast-paced event known as the triathlon. Even as Anda is known for its pristine beaches and natural beauty, when the race starts and everyone is on their heels, this paradise will turn into a field of obstacle that the participants would have to face. Garnering a distance of 42km on land, 3.8km in water and 180km on bike, this would have to be one of the toughest and longest race in the Philippines. And being spearheaded by none other than Bike King, it will be a race of epic proportions, as they were also the mind and body behind the success of the Tri United Series, Active Health Duathlon and last year’s Timex 226. In the hopes of continuing the same action-packed race from last year, the retention of certain elements from the first TIMEX 226 Bohol Triathlon, which was held last December 3, 2011, will definitely be implemented, but with additional route changes this time around, aiming to make a better race, a more fun-filled adventure and a higher level of excitement. As of October 2012, there are already 80 participants and countingwho are getting ready to take on 226 kilometers of pure adrenalin and precision movement, for at this type of competitions, its’ every person for himself/herself and every second counts. And while there are some who participated last year and signed up again for another round of action, there are also a majority of new faces, including multi-awarded coach, athlete, and member of the Timex Multisport Team, Ani de Leon-Brown. With everyone anticipating the official start of the race, it would be safe to say that practicing to be accurate is the key to snagging the first place at the finish line, and when right timing is of the greatest goal, look no further than with Timex, the watch that revolutionizes every athlete’s need, from telling the distance, depth or simply the cold or warmness of the terrain. Timex, a companion to the rough side of the race. You may visit the Timex® website (www.timexwatches.com.ph) or Like them in their facebook page (www.facebook.com/timexphilippines, www.facebook.com/timexsportsphil ) for more information. 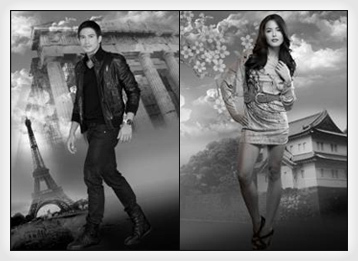 You may also follow @timexph on Twitter to get updates regarding their latest watch models. Even as Anda is known for its pristine beaches and natural beauty, when the race starts and everyone is on their heels, this paradise will turn into a field of obstacle that the participants would have to face. Garnering a distance of 42km on land, 3.8km in water and 180km on bike, this would have to be one of the toughest and longest race in the Philippines. And being spearheaded by none other than Bike King, it will be a race of epic proportions, as they were also the mind and body behind the success of the Tri United Series, Active Health Duathlon and last year’s Timex 226.A race has always been considered as a grueling form of workout, combine that with cycling and swimming and exhaustion is just a mere distance away. 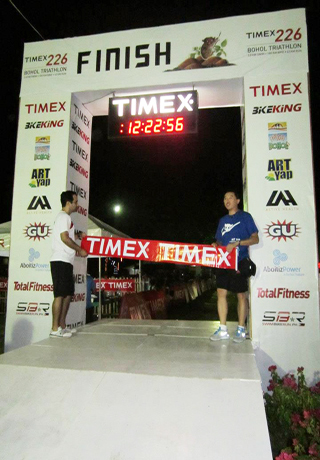 This however, would just be a piece of cake for the participants of the 2nd TIMEX 226 Bohol Triathlon. 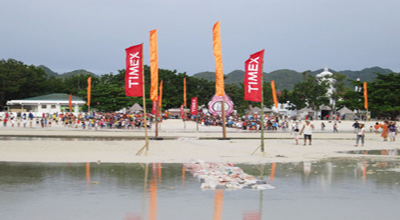 The said event which began last year will be initiating its second leg this coming December 1, 2012 at the Anda Beach, Bohol. The province well known to be the home of the wide-eyed tarsiers and chocolate hills will test the vigor and strength of the athletic buffs who were brave enough to answer the challenge of this fast-paced event known as the triathlon. Hopeful smiles. Newtrends International Corporation brand team with World Vision’s Boris Joaquin, Jun Godornes, and Marmie Liquigan, together with Fun Ranch’s Vince Padilla, Ana May del Rosario, magician Allan “Alakim” De Paz, and the new World Vision scholars. School-opener treats. Scholars Kyla and Roma are two of the children who are now making their way into a brighter future as supported by the partnership of Giordano Timewear and World Vision. A bright spectrum of hope. Now in new colors, baby blue, baby pink and baby purple, the Giordano Brights Collection keeps its wearer fashionable in style while being openhanded. In this era, nothing can be more important to a young soul dreaming of a good life but to be able to go to school. It does not only provide the key for a better tomorrow but almost automatically opens the door for bigger and wide array of opportunities. Ironically, what is supposed to be the less fortunate’s only hope to depart from poverty also happens to be one of the things they can’t get a hold of. Fortunately, there are people who dedicate themselves to guiding them so they reach this shining dream. Keeping hope burning for young Pinoy dreamers is Giordano Timewear, world-renowned brand recognized for bringing in the flair of the urban lifestyle with its stylishly designed watches. And this time, a name worthy of praise for taking a bold step towards helping underprivileged kids get proper schooling. Partnering with a Christian relief organization aimed to transform lives of oppressed children, World Vision, the brand supports the largest child sponsorship agency through its array of hip and vibrant multi-colored timewears, the Giordano Brights Collection. A project that started late of last year, the advocacy is meant to help the organization take more children to classrooms through a P100 donation garnered from every purchase of any Giordano Brights item. 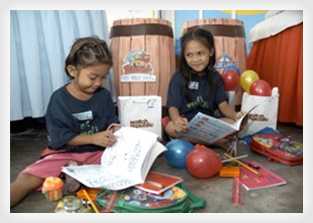 In just less than a year after, 10 fortunate kids from Malabon City benefited from the joint venture. 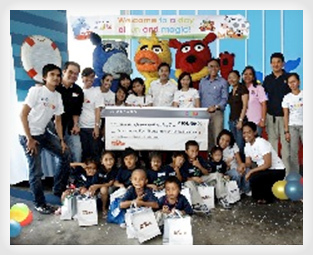 Recently in an afternoon of kiddie feast and entertainment provided by Funranch in Tiendesitas in Pasig City, Giordano Timewear officially turned over the amount of more than P100, 000 to World Vision’s area development program, which guarantees a two-year annual sponsorship plan for each of the young minds. Held at Fun Ranch in Tiendecitas Pasig Mr. Boris Joacquin, Director of Publicis in Ministry of World Vision, elaborated however that the advancement work doesn’t simply end there. “Thereafter, they are provided with the resources to meet identified needs, the end objective of which is to make these families and communities sustainable in the long-term – communities that are conducive for children to live life in all its fullness,” said Mr. Joacquin. With the success of the joint venture, Giordano Timewear celebrates with watch lovers and gives them more reasons to be colorfully hip with the addition of new dynamic hues to the Giordano Brights Collection. From the existing yellow, white, red, green, pink, blue and black, one can now also choose from either baby blue, baby pink and purple timepieces. These high-quality time accessories bears the vibrant ceramic look which also serves as stylish reminders that kids from the other part of the country were able to receive proper schooling simply because of choosing on being part of a modish cause. As the only treasure that one can use and keep for the entirety of his life, schooling indeed is more than a necessity. With a significant number of hopefuls still left behind, Giordano Timewear prompts everyone to also take a moment in showing concern for others, specifically to young dreamers who wishes nothing but a fair shot at education. Giordano Timewear is exclusively distributed by Newtrends International Corp and is available at any Watch Republic outlet or leading department stores nationwide. A TIMEX for everyone, anytime, anywhere. The TIMEX 2010 Collection lines up a stunning collection of timepieces that will certainly thrill the trendy, the sophisticated and every fashionista who desires total style and functionality. With abounding fashion trends all around, we sometimes find ourselves lost trying to keep up. Good thing there’s that one thing that never goes out of style- a product of global flair and superior quality. Proving that it is the internationally beloved brand for everyone, anytime, anywhere, TIMEX, world-renowned maker of high quality timepieces, brings us the TIMEX 2010 Collection. These latest sets of time-trackers retell the brand’s commitment to provide men and women fashionistas everywhere a sense of utter panache and perfection, combining it with its distinct elements of world-class comfort and functionality. The TIMEX 2010 New Collection is a diverse, stunning bunch that is sure to excite both the young and young at heart. With designs that weave in contemporary details with unexpected fashionable accents, one will certainly feel truly like a total standout. First to spell that crystal clear difference when it comes to time-tracking is the TIMEX SL Series with 92 Swarovski Crystals. Set to hypnotize with its splendid sparkle, this bejeweled wonder is the perfect accessory for every stylista who carries herself with sheer grace. What’s truly captivating about this piece is its eye-catching rose gold accents matched sunray dials with an intricate printed pattern. Water resistant up to 50 meters, women have the option to choose either to match it with a classic bracelet of the same strong element or go with the comfort of a genuine leather strap. And the luscious cherry on top? Its case is embellished with a shining 92 Swarovski crystals. Whoever said simplicity is beauty must have been thinking of the TIMEX Women’s Elegant Square. With a neatly fashioned sunray dial finish and printed dial pattern, this timepiece never fails to command attention. Perfect for the ladies whose grace and poise radiates as effortlessly, it has a stainless steel case paired with a genuine leather strap. Are you ultra-fun, daring and retro enough? If yes, the TIMEX Ironman 30-lap Shock Resistant might just be the one for you. 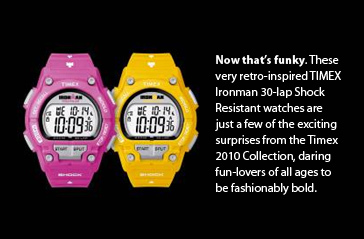 Rolling out in bright, chunky-funky colors in the much-loved Ironman classic case, this timewear dares trendsetters to make that banging fashion statement and show their true colors. This 100-hour with lap/split chronograph stunner comes with a big LCD area, mineral glass lens and 30-lap memory recall, making it both fashionable and very handy. Not to mention, it’s water and shock resistant to ISO standards too. For those who put earnest value to every second of their everyday, there’s the TIMEX T Series Perpetual Calendar, the watch that ultimately gives the correct time and date, every hour, every day, year-after-year. Aside from the reliable perpetual calendar movement, this wonder has an Indiglo night light feature matched flawlessly with a textured dial. Coming with a stainless steel case, one could choice to wear it with either a genuine leather strap or a metal bracelet. And as a plus, it is water resistant up to 100 meters. 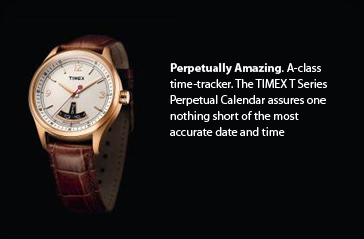 With the Timex Perpetual Calendar, you’re sure never to miss a birthday or anniversary again. 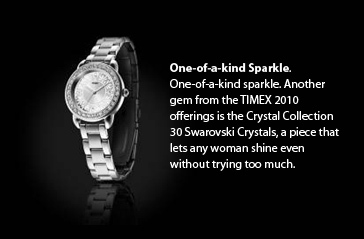 Truly chic and dazzling- that’s the TIMEX Women’s Dress Extension. Lovers of the classic, sophisticated look will love this fine piece that comes with a brass case and genuine leather or metal strap. Its “Mother of Pearl” dial helps add that hint of femininity just how a fair lady wants it. Bonus features for the woman who knows how to keep it low but still amaze are the INDIGLO night-light, water resistance up to 30 meters and the always valuable date feature. This season, TIMEX 2010 Collection offers us an outpour of options that will delight even the most discriminating and make everyone feel supremely special whenever, wherever. Some luxurious, some trendy; all of world-class style, comfort, functionality and quality. Timex watches are distributed by Newtrends International Corp. and are available at all Timex stores and leading department stores.